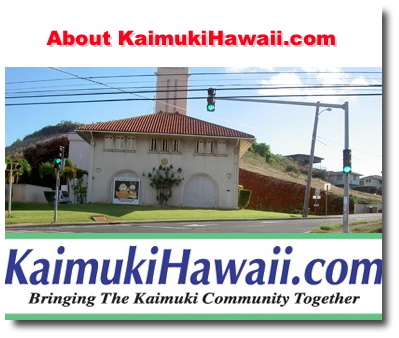 The mission of kaimukihawaii.com is to enrich the Kaimuki, Hawaii community by providing a easy, fun, and interactive resource to learn about Kaimiki community events, public resources, government resources, nonprofits, businesses, job and local happenings. By using a variety of creative Internet-based technical solutions we provide the pubic with resources to enhance community connections. Initially, KaimukiHawaii.com Web site was going to be an Ernest Abrams's community service project for the Kaimuki Business and Professional Association. However, it ended up evolving into personal cause, passion and community service for the entire community. kaimukihawaii.com is a way for Ernest Abrams to give back to his community and practice his passion/craft. Ernest Abrams is a resident of Hawaii for over 20 years and is also a Kaimuki resident. Ernest Abrams is a business/marketing/computer consultant along with being a software engineer/developer, webmaster and programmer. 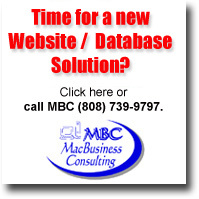 MacBusiness Consulting is a full-service business development and consulting company specializing in database and website solutions.